Dog door training typically doesn't take very long - the average dog will be running in and out within a couple days! And while not necessary for house training, a dog door can be handy to have. The biggest problem that I have with dog doors is that owners tend to exercise their dog or puppy less if they have one. Your dog is not getting exercise by going in the backyard throughout the day. To him, a backyard is just a big kennel. He still needs at least a half hour walk each day... yes, I said at least. Many high energy dogs require an hour or more of exercise every day! Dogs who don't get enough exercise are more likely to have other behavior problems like barking, inappropriate chewing, digging, and separation anxiety. So as long as you aren't using a dog door in place of giving your dog plenty of exercise (including on leash walks) each day, dog doors are great. Just like anything, you do have to train your dog to use one, though. Some dogs who tend to be shy or easily scared may take a little longer to start using it, but dog door training can work with any dog. All you need for dog door training is a handful of really tasty treats. Be sure that the area outside of the dog door is securely fenced in, as well. When you first install your new dog door, remove all the flaps if possible. The first step is to simply teach your dog to go through the door without the flaps attached. If the flaps are not removable, use some good, strong duck tape to pull them up and completely out of the way. This step is especially important if your dog tends to get frightened easily, or is timid! Never push or pull your dog through the dog door, as you will cause him to be afraid of it. This is the number one mistake owners make when dog door training. It's best to start training when the weather is nice for a few days, as you'll want to leave the flaps off at least for the first couple days of training (at least, for a timid dog). With the flaps removed (or taped completely out of the way), start inside with your dog. Let him smell the treat, and then toss it out the dog door. Most dogs will follow the treat outside quite quickly. If your dog is still hesitant to go through, leave him inside and go to the other side of the door. From there, you can call him to come to you, or use a treat to coax him through. Once he comes through, lay on the praise. Still not working? Wait until feeding time to train... put your dog outside the dog door, and put his food bowl inside the door. Make sure he knows it's there, and let him come in through the dog door to get his dinner. If you think he's more likely to come through if his food bowl is outside, then switch it around. Take your time - depending on your dog, this step could take a couple days. Repeat it over and over until he's fully confident running in and out (from both directions). Make sure you really praise him each time he goes through the dog door. Next, put the most light-weight flap back on the door. Start out the same way, with your dog on one side of the door and you on the other. Call him to come to you. Photo courtesy of northern green pixie via Flikr. This time, you'll need to push the flap open yourself for your dog to come through, and hold it up until he is all the way out. You may still need to coax him through, perhaps using a tasty treat. Again, praise him for going out his door! Repeat a handful of times, and slowly let the flap fall before he is all the way through the door. It's important that he get used to the feel of the flap on his back. Each time you call him to come to you, help him with the flap less and less. The goal is for him to push it open himself and go through on his own. This may take just a couple repetitions, or it may take a week of your helping him through. Every dog learns differently, and how long it takes really depends on how timid your dog is. Try hanging a tea towel over the hole instead of the plastic flap, and do the above exercise. It will be less noisy, so your timid dog will be more comfortable with this step. Once he is OK going through the tea towel, you can put the flap in and start the step over from the beginning. Always lavish praise for him going in or out the dog door! At this point of your dog door training, your dog should be happy and comfortable going in and out of his door on his own. You'll now want to reattach all flaps, as some of the heavier-duty models have multiple flaps on them. In particular, PetSafe brand has an Extreme Weather Pet Door that is great for colder climates like where I live (Canada). That Pet Place carries this brand, and it's 3-flap door will help any drafts, cold air, driving rain, or insects out of your house. We don't have a dog door yet on our house, but this is definitely the one that I would choose! Dog doors come in several sizes and types. When choosing a dog door, don't go with the smallest size that your dog could possibly fit through. Give him a little extra room to move through, otherwise you may have trouble with him being afraid to use the door! You can get dog doors that fit into your current solid door, a screen door, or even an outside wall on the house. Granted, the last choice will be the most work for you, but sometimes it's the only option that will work with your house. Of course, it's always best to have the dog door situated where your dog can go out into a fenced in backyard. This way, you don't have to worry about your dog getting loose while you are out. Plastic or aluminum, small or large, wall-entry or door-entry are all options you can choose from. There are even motion-sensor dog door available online! ThatPetPlace.com has a number of really good dog doors like the one pictured above. To take a look at what they have available, just click on the photo above of the PetSafe dog door. Take your time with dog door training, and you shouldn't have any trouble. 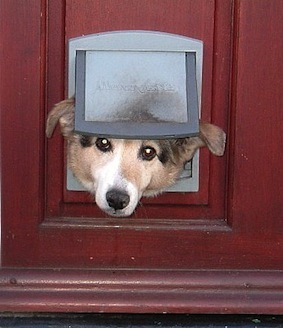 Timid dogs may need a little longer with training, but all dogs can be taught to use a dog door.